Over the past two weeks, Jane and I have embarked on quite a pie baking quest that has certainly had its ups and downs. However, through all those challenges and successes one thing remained fairly consistent and that’s the amazing pie crust recipe she sourced from Ina Garten. It’s the most wonderfully flaky crust with a rich buttery flavor that has just enough sweetness to balance even the most sugary of pies, but not too much to disqualify it from more savory purposes. 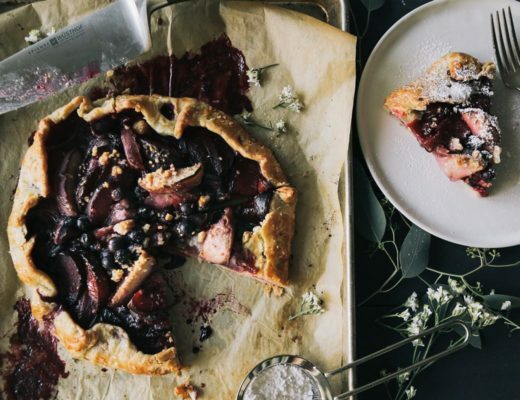 The recipe itself produces enough to make two pie crusts, so when Jane finished with her Summer Plum Pie recipe, I quickly snatched up the second half of dough to use for a quiche. 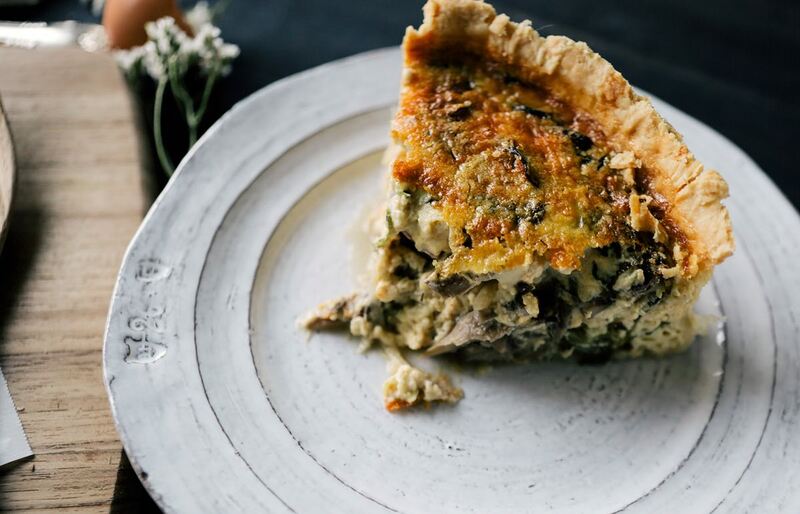 To me, a slice of quiche makes the perfect early lunch time meal. It’s that ideal bridge during the work week between breakfast and lunch which would typically be labeled “brunch” on the weekend. Served together with a small salad or a bowl of soup and you have everything you need for a well portioned meal with plenty of flavor and nutrients to get you through the rest of your afternoon without slowing you down. 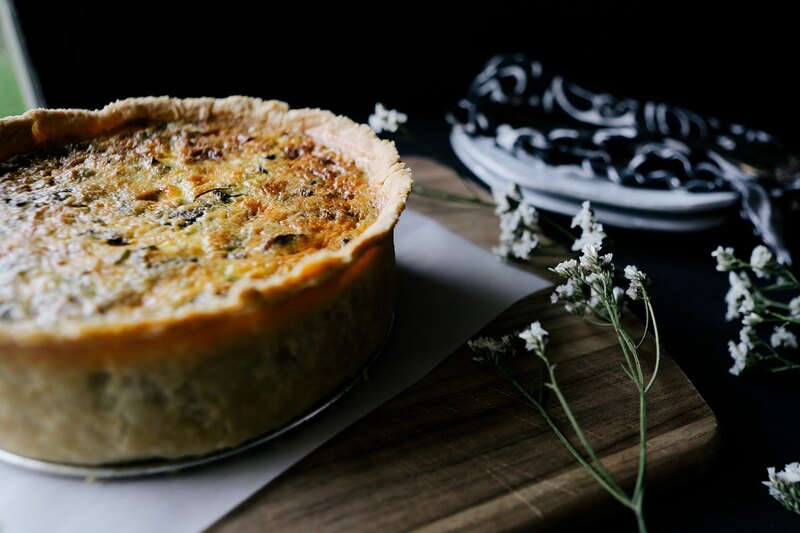 My favorite qualities in a quiche always come down to the height of the crust and the texture of the filling. I like a tall wall, deep dish style with a filling that’s firm but still holding on to the creaminess of the custard without being too egg-y. Otherwise, when the filling is too firm, it makes the crust seem dry and then you’re left reaching for sauces or condiments. 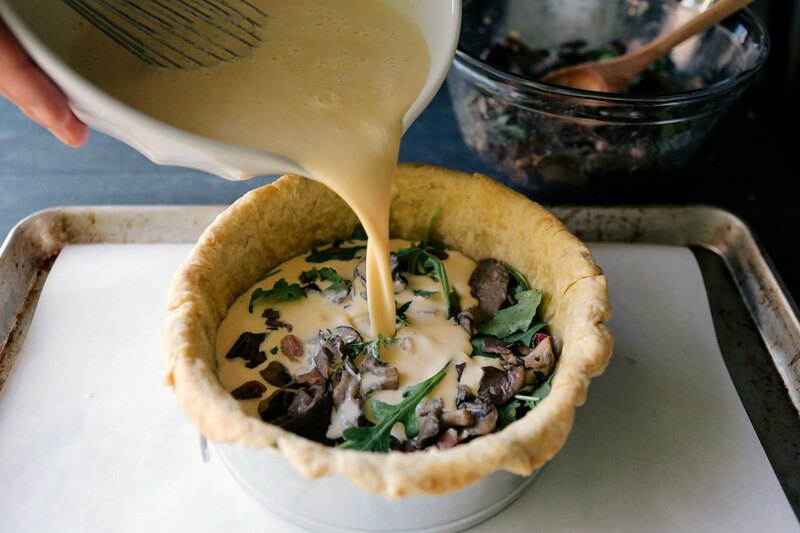 I want the quiche to stand on it’s own in terms of flavor and texture. 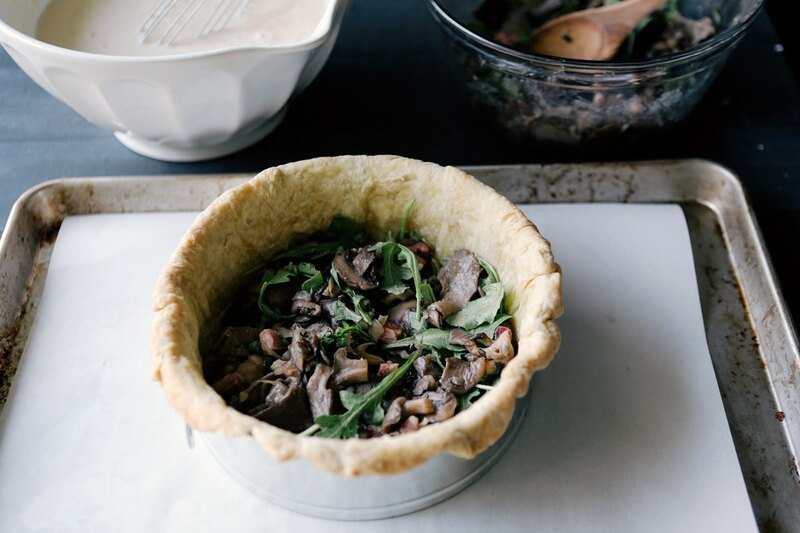 For flavor, I decided to go with a classic mushroom quiche that featured the salty smoky punch of pancetta. Throw in a little sage and I must admit the aroma had me thinking ahead to Thanksgiving. There’s a good chance I’ll be serving this up again around the holidays. 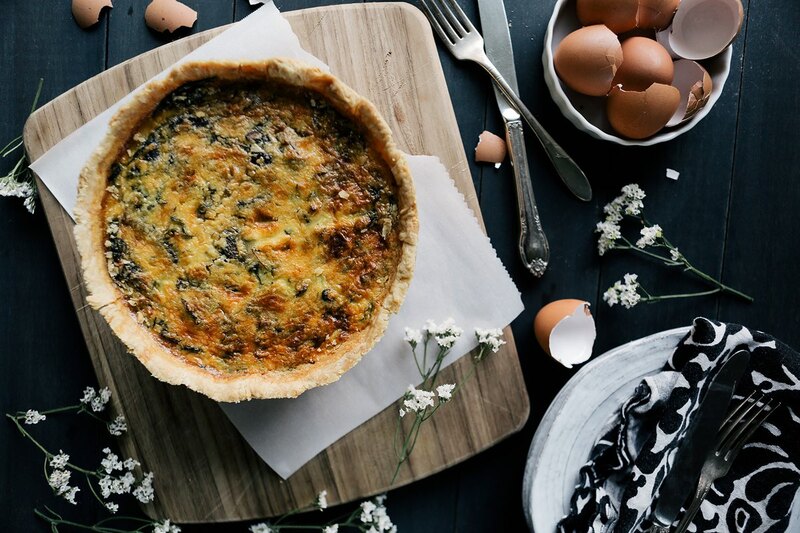 While making this quiche, I spent some time reviewing two recipes online that I highly recommend checking out for yourself as well. The first is Thomas Kellar’s adapted from his Bouchon cookbook. The other is Smitten Kitchen’s version. She offers some great tips on whether to par bake or not, how much dairy vs eggs, and other lessons she learned from testing his recipe in the home kitchen. The below recipe is similar but I wanted a few more components to counter-balance my love-hate relationship with mushrooms (i.e. I love mushrooms, but I hate when that’s all I can taste). I also elected to caramelize the shallots to add a bit of sweetness to each bite. Cube butter and shortening and chill in the freezer for 10 minutes. In the bowl of a food processor, combine 2 cups of the flour, salt, and sugar. Pulse briefly twice. Remover butter and shortening from the freezer and dump into the bowl of the food processor. Pulse 6-8 times, being careful not to over-process the dough. There should be big chunks of butter visible in the dough. Prepare a 8 or 9 inch spring-form pan (we used an 8″) with butter or cooking spray. Placing the dough between two sheets of parchment paper, roll out dough to about a 15-16 inches so there will be enough overhang once it’s placed in the spring-form pan. Once rolled to the suggested size, gently place the dough, still between the parchment, in the refrigerator for 10 minutes to chill. 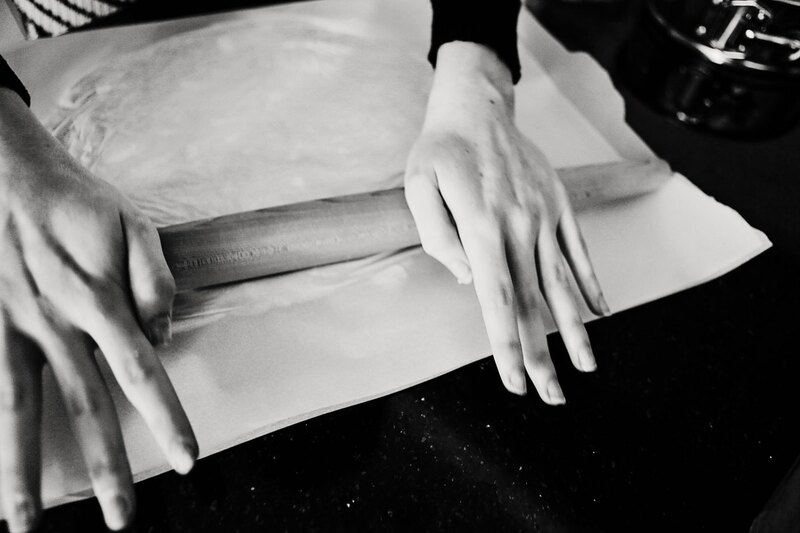 Once chilled, remove the top layer of parchment and gently roll the dough on to your rolling pin and transfer to the spring-form pan. Delicately line the pan with your fingers using any leftover dough to fill holes or tears. You want about an two inches of over hang to press along the edge. This can be cut off when you’re finished and removing from the pan. Place in the oven and bake for 40 minutes. Once completed, remove the weights and bake the crust for an additional 15 minutes or until just lightly browned. **Prepare the filling during this baking process. 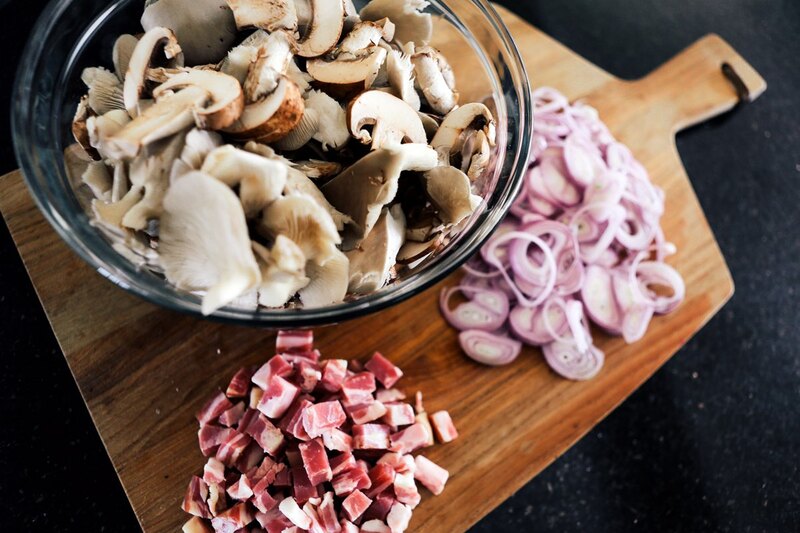 In a cold sauté pan, add pancetta and bring heat to a medium low allowing it render and cook to almost crisp (approx 8 minutes). Remove when ready, and set aside on a paper towel. Do not discard the oil that’s been rendered. Increase heat to medium and add butter to the oil left in the pan. Drop in the shallots and stir frequently until caramelized, approx 12 minutes. Remove from pan and set aside with pancetta. Add olive oil to sauté pan and cook mushrooms until soft, approx 12 minutes. Turn off heat and toss with pancetta, shallots, herbs, arugula, and a pinch of salt and pepper. Layer the bottom of the par baked crust with about half of the cheese and then half of the mushroom filling. In a large mixing bowl, whipped together the eggs, dairy, and seasoning until frothy. Pour custard about 3/4 of the way up the shell and add remaining filling, top with cheese and place in the oven. Bake at 325 degrees F for about 1 hour, 15 minutes. 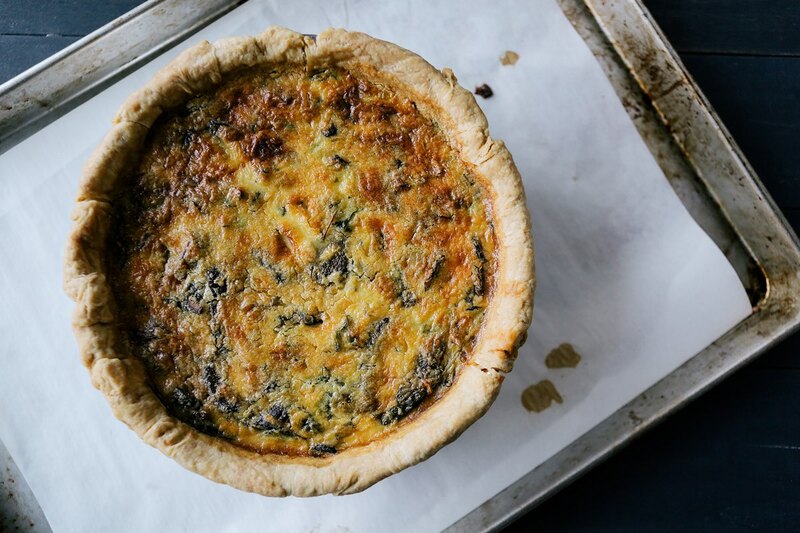 The top should be golden brown in spots and mostly firm when tapped with just the slightest jiggle at the very middle of the quiche. Allow to cool in the pan for 15 minutes. 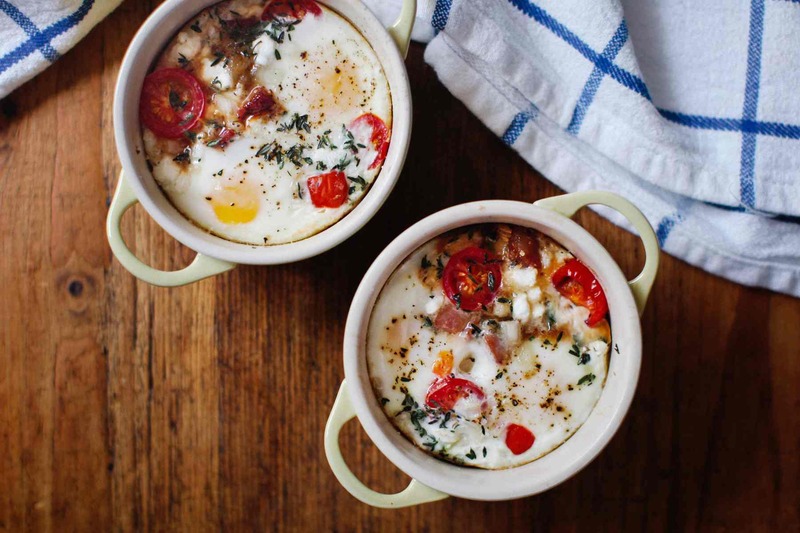 Baked Eggs with Pancetta, Goat Cheese, Thyme & Brand New Cocottes! I so agree on the tall quiche! I’ve been looking for an 8 inch spring form but haven’t found one yet. Where did you find yours? I’ve seen so many shallow tart/quiche dual purpose pans with scalloped edges. They leave me with a thin quiche that doesn’t feel fluffy or moist enough, and the crust burns into each scallop fold. Thanks for this beautiful recipe! Give it a try. This recipe can work in a 9″ springform as well if you can find one of those more easily. It’s a pretty big quiche but I think I liked it even more the next day. Rachel, can I line the pan with parchment paper and non stick along the sides so when baked and cooled I can just lift it up out from the pan? Shonna, are you not using a springform? If not, the only thing I would worry about is the weight of the quiche but I still think you’ll be fine. Either way, I’d say go for it!